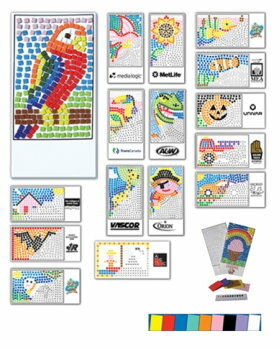 The foam Mosaic Puzzles work just like a paint by numbers picture. But instead of painting you are provided with small pieces of colored foam that you attach to the numbers on the puzzle. Each puzzle provides an overall area of 9 3/4" X 5" and the custom imprint area at the bottom of the puzzle is 4" X 2". This is a great product for kids 4 and up that need an activity to fill their extra free time at restaurants, hospitals, waiting rooms or travel situations. Each puzzle is polybagged with EVA foam numbered templates peal 'n stick foam pieces, color legend and adhesive hanger. Available in foam colors of Black, Blue, Green, Orange, Pink, Purple, Red, White and Yellow. Minimum order with a custom imprint is 100.